How to make super easy Crock Pot Pulled Chicken. 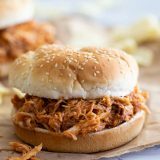 A simple, homemade bbq sauce simmers with chicken breasts and thighs for these easy BBQ pulled chicken sandwiches. In a medium saucepan, make the bbq sauce. Melt the butter over medium heat. Add the onion and cook, stirring often, until softened. Add the ketchup, lemon juice, brown sugar, Worcestershire sauce, cider vinegar, dry mustard, salt and red pepper flakes. Stir to combine. Cook over medium heat for 5 minutes. Spray the inside of your slow cooker with nonstick cooking spray. Place both the chicken breasts and the chicken thighs in the bottom of the slow cooker. Pour the bbq sauce over the top, then gently stir to coat the chicken. Cover and cook on low for 4-6 hours, or until cooked through. When the chicken is cooked, use 2 forks to shred the chicken right in the slow cooker. Stir to combine completely with the sauce. Cover and cook on low for an additional hour.